According to the fishal, were playing them on Saturday, 7:45 pm kick off. That going to be some rush back from Colchester. I was was very concerned after 30 mins of drab garbage. Looked very lacklustre. O'Grady and Lang were transformed second half and movement was vastly improved. Baxter out for this and Saturday too? Nepo looked knackered, so probably rest him and play Dearnley from the off. No problem with the same XI that's just won 2-0. Tranmere will go into it as favourites but they're more likely to grind a win out against us than play us off the park. The XI from Saturday will match up well against them and I wouldn't be surprised if we get a point or three. Under normal circumstances this could have been a massive game and you’d have been looking at 7k+. oh, and did I mention Fulham Away? Not a complete waste of a season, just an opportunity missed I feel. I was at the Macc game. Can't say it is going into the pantheon. Carrying a couple of injuries and a couple have had flu this week. Well, things going remarkably well at Prenton Park at the moment. Recall we were on the same points when Scholes took the helm. Really thought Oldham would kick on after that, but some things just don't work out I guess. Meanwhile, unbelievably, we've won 7 on the bounce and even put ourselves in with a chance of automatic promotion. Despite our contrasting fortunes over the last couple of months though, I am expecting nothing less than the customary close affair. Believe we will be bringing about 2K, which unfortunately won't include myself this time due to poor health. Shame the Saturday fixture was called off, but it really was a filthy day. 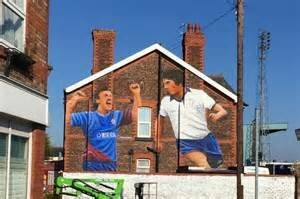 A cool mural is going up on a house next to Prenton Park btw - really brightens the place up. Maybe something you could look at doing by Boundary Park? If we painted the gable end of the main stand it might hold it together for a few more years. No chance. The Council and residents would be aghast at such a plan. We get knobheads who move into a house next to a Football stadium and then start complaining about the Football stadium. Wary of this one from a TRFC perspective. Can't recall the last season we were in a league above you if we ever were and Mr Wild's a diehard 'tic who no doubt went to games regularly during the Ronnie/Ian era and he'll know the importance. Think it'll be tight and tense. 0-0. Was Baxter a 3 game ban? Can’t even remember what he was sent off for now? Was it violent conduct, which is a 3 match ban? Or just a bad tackle, which is usually 1 match ban (could be wrong)? Cheers. What did he get sent off for exactly? I have literally forgotten. Local residents moaning , and surprising but general hostility to the club from the council and people in the town, must be a universal theme then, because you could have been describing the way things are for us too. The mural, as made up as we are with it, has already attracted some criticism from the moaners, as has the plan to put lamp standard banners in Prenton Road West on the approach to the ground, similar to how all the big clubs do. My theory is that "supporters", mostly tele-clappers, of our respective more glamorous big city neighbours actually feel guilty about not supporting their local club, so wish it wasn't there to remind them of their disloyalty to their own town. We, in the other hand, stick with our local clubs through thin and thin, and for all the heartache, but just occasionally, they will provide us with brief moments and experiences that they could never dream of experiencing, where you are momentarily transported to dreamland and feel an explosion of pride and joy that they will never know. Comfort yourselves with that when being patronised or belittled, as it it us, the small band of purists, who pay our dues, but when they come, the highs are all the more higher for that! That's what I keep telling myself anyway!